Many months ago my daughter and I were invited by a friend of mine to her little girl’s 2nd Birthday party. I really enjoyed taking the time to select a few girly gifts after having inquired as to what she would most need and want. The party was beautiful and a lot of fun. As the birthday girl unwrapped her gifts towards the end of party, I watched as her mother dutifully took notes of who gifted what which is why I was a bit surprised when I realized that several months had passed without having received a thank you note for the gifts. I always like to give the benefit of the doubt, let's face it, the postal service isn't perfect. However, in this scenario, I experienced the same with her wedding and baby shower. This really got me wondering if thank you note writing is becoming a thing of the past for many and what we can do to revive it. Since the time I was a little girl my mother instilled in me the value and importance of being thankful which included writing cards to family and friends thanking them for birthday gifts or to my grandma and grandpa for sending Christmas money in a card, after having been invited to a special event or for inviting me to a sleepover, and it’s something that has always stuck with me. In today’s digital age of text messages and e-mail, it’s a breath of fresh air to receive something lovely in one's mailbox amid the usual bills, flyers and junk mail, from someone who feels truly appreciative and takes the time to express it in their own handwriting. It’s sometimes hard to believe there was once a time when everything was handwritten in beautiful calligraphy and delivered by messenger. I think this gesture is appreciated even more today than ever since it has become a bit of a lost art. The beauty though, of this rarity as with any in life, is that it can allow you to stand out in the hearts and minds of others which is of particular importance in the business world while interviewing and building business relationships and of course bodes well in all of our daily relationships. At the end of the day people just want to feel valued and appreciated and we have the ability to communicate that with a note. When someone has gone out of their way to help you, write a recommendation for you, has referred work to you or has invited you over for dinner or a party, it’s important to remember to thank them. They have put a lot of effort, time and thought into their actions, so it’s only polite to reciprocate. While verbally acknowledging the giver or host/hostess in question is always a must; a thoughtful gesture is to write a thank you card and pop it into the mail in a timely manner. 1. Gifted with Money/Presents-Receiving actual cash in hand or a present is probably the most obvious time to send a thank you. This can range from birthday gifts all the way to a temporary loan. 2. Gifted with their Presence-Whether it’s a loved one who flew in to share a special moment with you or someone who helped you to improve your resume or has been extra supportive during a difficult time. 3. Gifted with Time-Perhaps your in-laws watched your children while you escaped to the spa for the day or a neighbor helped you put up a new fence. 4. Gifted with an Opportunity-When a friend has recommended you for a job position within her company or you have received work as a result of someone referring you and your company. 5. Gifted with Personal Belongings-Whenever you were loaned a baby swing, hedge clippers or a cake stand (just to name a few) or anything else that will be returned back to the lender. 2. Thank the giver for what they have done for you-Whether it’s providing free passes to a theme park or picking up your mail while you were on vacation. 3. Tell them how their thoughtfulness blessed you-Share what a wonderful time your family had at the theme park for example complements of the tickets you were gifted with, with a quick highlight or two from the day. When it comes to borrowing an item, let the person know that you’re thankful that you have such a dependable neighbor and friend who you can count on. If someone had collected your mail while you've been out of town, you can offer to do the same in return when it’s their turn for vacation (if you intend to follow through). 4. Sign off in a sincere way- You can never go wrong with ‘Sincerely’or ‘Warmest Regards’ along with your name or the names of those in your family, etc. You can also use 'With Gratitude'. I like to keep a variety of note cards on hand, specifically thank you notes and a few great pens. 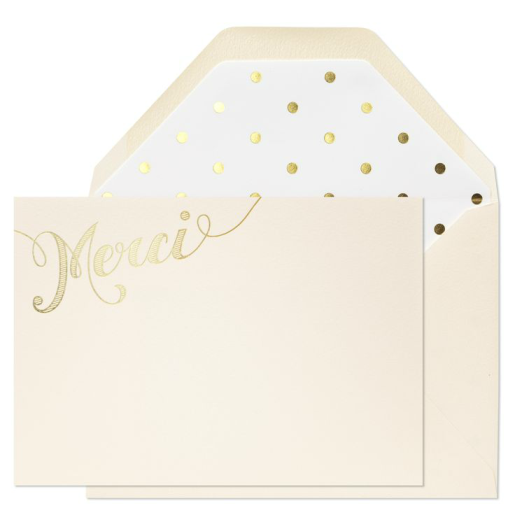 I'm loving these elegant pink, polka dot with gold foil Merci note cards-so soft and feminine. While I shop at an array of stores, boutiques and vintage shops to build my stationery collection, I tend to find myself gravitating towards the fun, classic and fresh stationery that Kate Spade has to offer. They are my immediate go-to for gifts for any occasion, especially when I'm shopping for a girlfriend. 1. 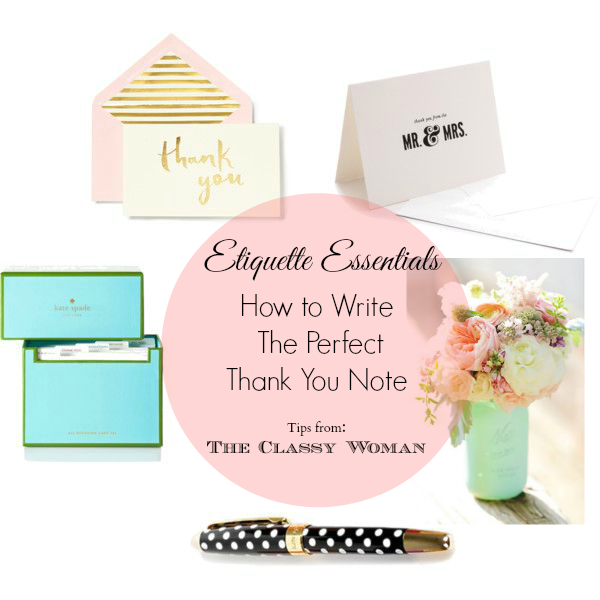 Gather the Essentials-Whether it’s a monogrammed set of personalized note paper or a pretty package of note cards that reflect your personality, begin stocking up on pretty thank you cards in advance. Building a little collection makes writing those ‘thank you’s’ so much easier when you have everything you need on hand. One of the beautiful things about the forever stamps here in the U.S. is that they will never be outdated in terms of postage fees so place a few rolls into a lidded box along with your cards, envelopes and your favorite fountain pen and you’ll always have just what you need. You could also keep a small printed list of addresses for your nearest and dearest or a little address book if they are not stored in your phone's contacts or elsewhere. I keep mine in an excel spreadsheet on a USB drive. When everything is organized and gathered in one place it makes things so much easier and you’re more likely to actually get it done. 2. Finding the Right Time & Place-The main reason why a lot of thank you notes don’t get written or mailed out in a timely manner is because we haven’t made the time to write them. For everyone this time will be different. I once read that Princess Diana would take the time to write hers just before bed. That is a great time to do them, or perhaps on your lunch hour at work, keep a few in your desk while everyone is lunching and you have some quiet time to yourself. It’s a wonderful way to introduce gratitude into our day also, focusing on what we are thankful for. Make it a ritual and always write them in the same spot such as a writing desk, the dining table or in bed with a tray if you like to be extra cozy. 3. Avoid Becoming Overwhelmed-When writing cards in reply to a bridal shower, baby shower or your wedding day, the thought of writing 50 or 100 cards out can seem like a daunting task. Step number one is to ensure you order yourself some return address labels online which saves time and a hand cramp. ;) The majority of online stationery shops will print the addresses of those you are mailing in addition to the return addresses right onto the envelopes, or you can print your own clear labels easily using an excel document with all of your addressees. My best advice is to break it down focusing on just a few per evening. Feel free to have your husband help out with the replies, sharing in the duty since it's not the woman's responsibility. If he has poor penmanship, he can always attach the stamps and address labels. Perhaps you can write the cards to your family and friends and he can do so for his own, etc. or randomly split the duty in half. Writing 5 cards per night is far less overwhelming than trying to tackle them all in one day, and you shouldn’t aim for that as you won’t be as fresh in your remarks, it will start to feel monotonous and it will come across to the recipient. It’s important to reply in a timely manner. Obviously, a thank you note sent late is better than no card at all but there are some timelines to be mindful of. Here are a few common ones. Wedding Thank you notes-within 3-6 months’ time but try to send them within the first month or two after returning from the honeymoon so those who couldn’t attend (but who shipped a gift to you) know it was received. Birthday, Graduation & Housewarming Gifts-These should all really be sent within 1-2 weeks. Baby & Bridal Shower Gifts-It’s always better to get to these sooner vs. later, best if sent within 2-4 weeks, preferably before the baby arrives or the wedding date, since babies don’t always arrive on their due date it may mean writing them afterwards, if that is the case, try to aim for no more than 3 months after the shower date. I’d love to know….what is the most memorable thank you card you’ve received? Perhaps it was unexpected or beautifully written with a lot of heart. Do you feel thank you notes and handwritten cards in general are a dying art form? January is a time when we all tackle our fresh new goals, vow to put our best foot forward and some of us (a lucky few) may take some time off to travel to an exotic locale. I had some fun compiling my favorite classy items which include resort wear, practical desk essentials that add a bit of glamour including a new must-have 2015 agenda planner, cozy winter attire, the perfect accessories for a fun and polished look as well as a few good reads too! It doesn't get too cold here in Florida but we recently experienced a drop in temps for a few days, just in time to pull out my favorite jackets, cozy slippers and scarves. As the warmer weather has crept back in, it has me thinking forward to springtime and I have to admit I'm kind of obsessed with this silk top, this romper, this gorgeous bag and these dreamy heels right now-all 4 are definitely on my wish list! *Simply click on any item images above and you'll be linked directly over to the exact item on the retailer's page for more details! GAP-Save up to 75% off during their winter sale! WILLIAMS-SONOMA-Semi-Annual clearance event. Save up to 75% off! C.WONDER- 50% off everything during their Semi-Annual Big Wonder Sale! What types of things do you most gravitate towards in January? Are you headed anywhere tropical? With this fresh year having just begun, I find myself evaluating little things that I can do or change to make my life more enjoyable and meaningful and essentially help me become a better person. I mentioned my Top 3 New Year's Goals in our last post but beyond those, I want to continually be growing and evolving more into the woman that I want to be. I've noticed a dissatisfaction I feel at times particularly while browsing Instagram. 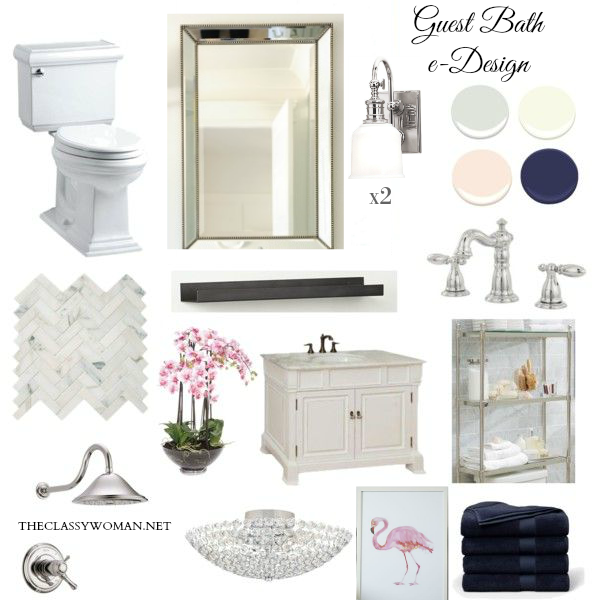 While I often find it a source of great inspiration for new recipe ideas, workout moves, photo angles I want to use, palettes for interior design, outfit combinations or working harder to enjoy some of the finer things in life, sometimes I find myself getting caught up in seeing all of the ultra-glamorous and "perfect" images that a particular account has shared. It can tend to leave me feeling as though my own home or life is less than, particularly if the person sharing is doing a whole lot more of what I wish I were doing in that moment-traveling to countries I haven't yet visited, building a grand custom home, vacationing in gorgeous destinations, dressing up in oodles of high end pricey garments, heels, handbags and being photographed in stunning locations. Can you relate? I do quickly snap out of it by reminding myself that social media snapshots are just that, a snapshot in time of a moment, not someone's entire existence. This led me to sharing today's quote as a reminder because if I struggle with these thoughts at times than I know for sure there are other women who have felt the same way. Comparison truly is the thief of all joy. Isn't it? I find the most contentment in life when I'm busy, head down and working towards my dreams, coming up for air to enjoy the company of loves ones and celebrating with those who have worked hard for their own accomplishments, inspiring my more of my own! Do you find yourself struggling in this area too at times? 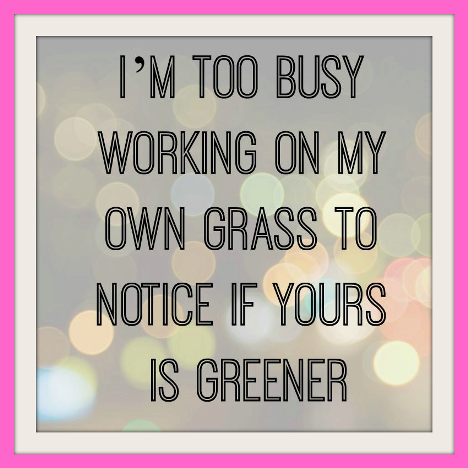 How do you remind yourself that the grass isn't greener on the other side of the fence?